Sehr guter Mulcher zum anständigen Preis. War auf der Suche nach einem vernünftigen breiten Mulcher für meine Wiesen und Pferdeweiden, um schnell und effektiv zu mähen. Leider auch schon mal einen großen Stein übersehen. Aber kein Problem, Ersastzschlegel waren schnell geliefert und ich konnte wieder durchstarten. 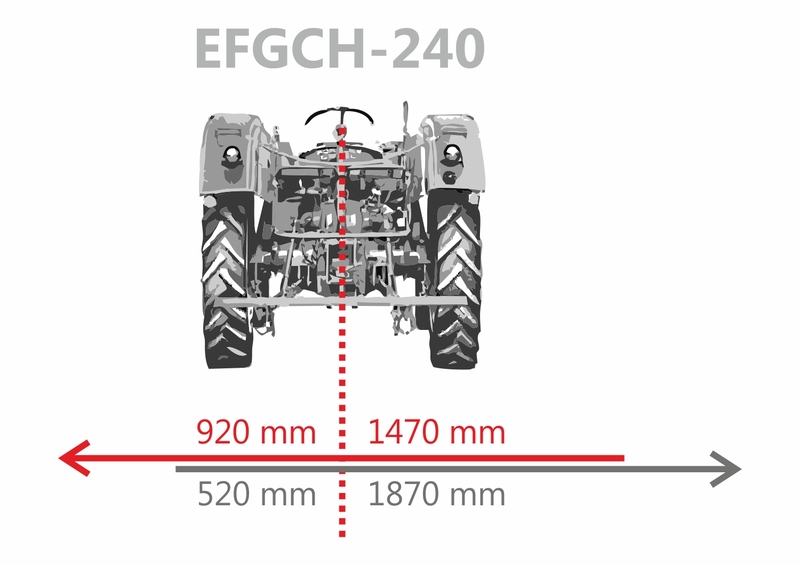 The especially robust construction of the mulch mower EFGCH-240 with hydraulic sideshift makes it stand out. It has a special reinforced angular gearbox and is outstanding in its operation as a mulch mower, a flail mower, etc. The flail mower has a mowing width of approx. 239 cm and is driven using a P.T.O, included as part of the delivery. The 32 specially hardened, 0.8 kg hammer blades, which are arranged on a double spiral drive shaft, shred clippings to a minimum size. Even very high grass, bushy or straw-like clippings are no problem for this mower! The mower unit is hung using the three point linkage of your tractor (from Cat. I. upwards). Your tractor should have at least 60 HP. Due to the size of this machine, it is required that the customer provides assistance unloading the shipment, via a tractor or forklift of some kind.